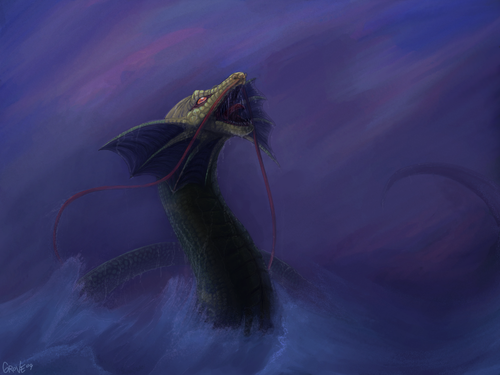 From the depths of the sea, he comes, fury in his flailing tail and all the ocean whipped to froth around him. We have come to witness his arising, the seeking of his wrath toward the sky. He is the dark of the night compelling, a rising serpent on wings of storm who opens his mouth for the moon. A little at a time, the wide maw captures the curve of the lunar disc, turns bright to blackness. A bowl of darkness in which the stars intensify, the sky glares for a moment, empty. Then the silence of the night gives way to clamor – banging – drums – a cacophony that comes from the islands behind us and drives against the dark. As the noise grows, so does the light. A little at a time, the dragon disgorges the moon and descends into the sea. He will sleep until he grows hungry again. The people will be waiting. Have a suggestion for a creature that belongs in the Bestiary? Leave it in the comments!